Raw Data Builder is designed to preview intensities of the raw data (which had been imported before) and calculate statistical characteristics form the raw data. Raw Data previewer represents the intensity traces of raw data in both channels. Statistical Characteristics panel represents the calculated (or measured) statistical characteristics and allows to calculate and store the new ones. Status bar, which is a horizontal area in Raw Data Builder window below the all panels, provides information about the current state of application and any other contextual information. Displays raw data file names linked to the selected FFSDB.hlpraw data (it is viewed only if a number of raw data files more then one). One can link many raw data files to one record in the RawData table when necessary. Especially it is useful when these raw data files represents a series of measurement with the same conditions. It reduces the number of stored records and allows performing the some actions for each measurement just by clicking one button. Check this radio button if you want to calculate the statistical characteristic from each raw data file shown in the grid. The calculated statistical characteristics are stored in the database automatically and have name with autoincrement number. Check this radio button if you want to calculate the statistical characteristic from the selected raw data file. Describe the selected raw data. Displays intensities in the red and blue channels. Visibility of charts is governed by correspondent checkboxes in the Statistical characteristics panel. It is possible to change the number of bins (or bin time), redraw the intensities and reject unwanted pikes of intensity. Click the corresponding item on the picture displayed above to get more information about it. Opens Burst Rejection window in order to reject unwanted bursts of intensity while calculation of any characteristic. Displays the number of bins used for calculating raw data intensity. You can enter other value. 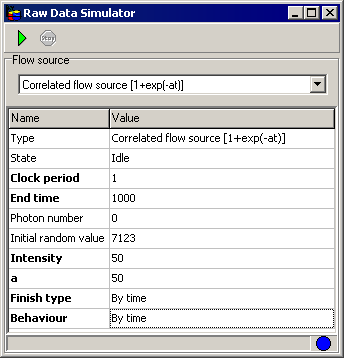 Displays the bin time used for calculating raw data intensity. Calculates raw data intensities and redraws them. This button opens the help window that describes how to work with Raw Data Builder. Displays the raw data intensity in the red channel. Displays the raw data intensity in the blue channel. Raw data chart is standard 2D Chart with markers that displays intensities in red or blue channels. One can select necessary time range of raw data for calculating statistical characteristics by means data markers. set linear or logarithmic scale for the Y axis and do many other things through local menu. Customize markers: Opens Markers editor for changing style of marker lines and setting marker positions. Allows to calculate the statistical characteristics from the selected range (with help of data markers) of raw data and manage them. Allows to select the active channel (for further calculation of characteristics). Allows to specify number of points of statistical characteristic to be calculated. For autocorrelation and crosscorrelation Number of points equals the number of time lags. For fluorescence factorial cumulants Number of points is the number of calculated cumulants. For the other types, Number of points equals the number of bins of the correspondent histogram. The meaning of Time step depends on type of the calculated characteristic. For autocorrelation and crosscorrelation functions and coincidence histogram Time step has the meaning of time lag (for logarithmic scale - minimal one). For PCD and FFC Time step has the meaning of Time Window (bin time). For the other types Time step has the meaning of bin time of the correspondent histogram. Note: for coincidence histogram Time step has the meaning of time lag at which the coincidence values are calculated but not the bin time of the histogram. Set on/off the calculation of weight factors. For autocorrelation and crosscorrelation weight is calculated by the algorithm proposed by T.Wohland. The standard deviation in Fluorescence Correlation Spectroscopy// Biophysical Journal, Volume 80, June 2001, Pages 2987-2999 (third method). For FFC the weight is calculated as standard deviations of factorial cumulants. For the other types of statistical characteristics the weight is calculated assumed the binomial statistics of data in a channel of the correspondent histogram. The meaning of Count depends on type of calculated characteristic. For autocorrelation and crosscorrelation this up/down edit allows to specify the number of parts on which the raw data time trace is subdivided for weight calculation (for better statistic it should be not less then 6). For Coincidence histogram Count specifies the number of parts from which the coincidence values are calculated (actually it specifies the total number of coincidence values used for building the histogram). Allows to filter the Files table by the type. Calculates the autocorrelation function (AC). It is possible to choose linear time scale or quasi-logarithmic time scale with time lag increasing with time. Quasi-logarithmic without averaging autocorrelation function is calculated at increased time lags (quasi-logarithmic time scale) but without rebinning, i.e. with initial bin width. It allows to minimize triangular averaging effect. Typical TimeStep (time lag) value for FCS measurements is 2E-7 sec. Calculates the autocorrelation function with constant time lag. Calculates the autocorrelation function based on quasi-logarithmic time scale with time lag increasing with time. Calculates the autocorrelation function based on quasi-logarithmic time scale. It is calculated at increased time lags but without rebinning, i.e. with initial bin width that allows to minimize triangular averaging effect. Calculates the crosscorrelation function (CC). It is possible to choose linear time scale or quasi-logarithmic time scale with time step increasing with time. Quasi-logarithmic without averaging crosscorrelation function is calculated at increased time lags (quasi-logarithmic time scale) but without rebinning, i.e. with initial bin width. It allows to minimize triangular averaging effect. Typical TimeStep value for FCS measurements is 2E-7 sec. Calculates the crosscorrelation function with constant time lag. Calculates the crosscorrelation function based on quasi-logarithmic time scale with time step increasing with lag. Calculates the crosscorrelation function based on quasi-logarithmic time scale. It is calculated at increased time lags but without rebinning, i.e. with initial bin width that allows to minimize triangular averaging effect. Calculates the Inter-event Time Distribution (IED): histogram of the time intervals between the concequtive photocounts. It is possible to choose linear time scale or quasi-logarithmic time scale with time step increasing with time. Typical TimeStep value for FCS measurements is 5E-8 sec. Calculates the Inter-event Time Distribution: histogram of the time intervals between the concequtive photocounts based on the constant time step. Calculates the Inter-event Time Distribution (IED): histogram of the time intervals between the concequtive photocounts based on the quasi-logarithmic time scale with time step increasing with time. Calculates the Photon Counting Distribution (PCD): histogram of the number of photocounts arriving within the Time window (Time window = Time step). Calculates the First Event Distribution (FED): histogram of the arrival times of the first photon within the Time window (Time window = Number of points * Time step). Calculates the Single Event Distribution (SED): histogram of the arrival times of only single photon within the Time Window (Time Window = Number of points * Time step). where P*(n) is the measured photon counting distribution i.e. probability to detect n photons within a counting time interval T (Time Step), the angular brackets indicate averaging with the set of probabilities P*(n). Intensity is a histogram of photon arrival times (Bin time=Time Step). One can inspect any part of the raw data in details with help of this characteristic. Coincidence Values Histogram is a histogram of coincidence values calculated at given sampling time (Time Step). where Ni and Nj are the absolute photon count numbers of the emission signals in consecutive time channels m, each with sampling time Time Step. Appends the calculated statistical characteristic to the Files table. Updates the selected record in the Files table with the calculated statistical characteristic (i.e. replace the stored characteristic with calculated one). Related parameters are updated when necessary. If this button is down the single statistical characteristic is calculated. If this button is down a set of statistical characteristics with varying bin time are calculated. Number of characteristics and bin time range are specified in the Calculation options dialog box that is displayed each time before starting calculation. Autocorrelation function can be either liner or quasi-logarithmic (time lag either increased with time or not). Here M denotes the total number of channels, n(t) - the intensity (or number of photons in a bin of time t), - the bin width (Time Step). Crosscorrelation function can be either liner or quasi-logarithmic (time lag increased with time or not). Photon Counting distribution (photon counting histogram) is a histogram of the number of photocounts arriving within the Time window (Time window = Time step). Number of histogram points is automatically increased when number of photocounts exceeds the value specified in the Number of Points edit. Inter-event Time distribution is a histogram of the time intervals between the concequtive photocounts. It is possible to choose linear time scale or quasi-logarithmic time scale with time step increasing with time. First Event distribution is a histogram of the arrival times of the first photon within the Time window (Time window = Number of points * Time step). Single Event distribution is a histogram of the arrival times of only single photon within the Time Window (Time Window = Number of points * Time step). Note: Weight factors are calculated for the five first cumulants (if Weight calc. check box is checked). Weight factors for all other cumulants are zero (if Weight calc. check box is checked). If Weight calc. check box is not checked, wheight factors for all cumulants equal unity. Therefore they do not participate in the analysis (i.e. do not participate in the calculation of the criterion value), though residuals are displayed. View Characteristics: Set the visibility of the characteristic itself. View StDev: View standard deviations (weighting factors) of each point of the characteristic. This local menu item is unavailable if standard deviations have not been calculated. To calculate them check Weight cacl. check box (it allows to calculate standard deviations of each point of the characteristic from the raw data) or use Calc.Weight local menu command of the DataSet panel of the main window (it allows to calculate standard deviations of each point of the characteristic from the set of characteristics measured (or calculated from the raw data) under the same conditions). View Rel. StDev : View relative standard deviations of each point of the characteristic (i.e. standard deviations of the point divided by the point value). Displays the calculated statistical characteristics. It displays the Observation files (Measurements Database) related to the linked with the selected raw rata Files Group as well if such files were imported together with raw data.
? This table can be sorted by any field. To perform the sorting by the given field, select this field and choose Ascending/Descending menu items in the local menu. This 2D Chart displays the calculated statistical characteristics and imported Observation files . Refresh Refreshes the information in the table. Valuable in multi-user application when several users work with the Database simultaneously. Append Appends the calculated statistical characteristic to the Files table. Update Updates the selected record in the Files table with the calculated statistical characteristic. Use the Raw Data Simulator to simulate the raw data time trace with constant intensity and given autocorrelation function. This button start the simulation of the raw data. At the beginnig of the simulation Export to the Database dialog box are opened. This button stops the simulation. Uncompleted raw data trace will be saved to file and exported to Database. Button "Export to ASCII file"
Exports simulated raw data to the ASCII file. Opens standard Save File dialog box to select the file. Button "Export to the Database"
Opens Export to the Database dialog box to export simulated raw data time trace to Database (RawData table). Allows to select the source used for simulation. This button opens the help window that describes how to work with Raw Data Simulator. Here you can specify parameters of the raw data simulation. Here you can specify parameters of the model used for the raw data simulation. This window monitors the information about the simulation progress. Use Export to the Database dialog box to export simulated raw data time trace to RawData table (Measurements Database). Displays the stored raw data in the Measurements Database. Displays the stored raw data. Describes the stored raw data. Allows to choose red or blue channel where simulated data will be stored. This button finishes work with the dialog box and applies all changes. Use this edit box to specify the raw data file. This button finishes work with the dialog box and discard any changes. This button opens a standard Save File dialog box for specifying of raw data file. This button opens the help window that describes how to work with Export to the Database dialog box. 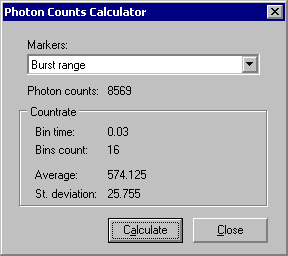 Use Photon Counts Calculator dialog box to calculate number of photons in a time range of raw data defined by data markers. This button closes the dialog box. This button starts the calculation. This combobox is used for selection of needed pair of data markers. Std. deviations displayes the standard deviations of number of photons in a bin. 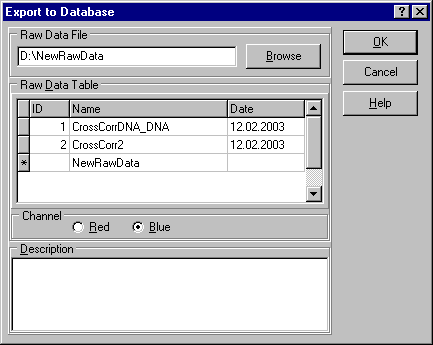 Displays names of raw data files linked to the selected record in the raw data table (it is viewed only if a number of raw data files is more than one). The number of raw data files is indicated below this grid. 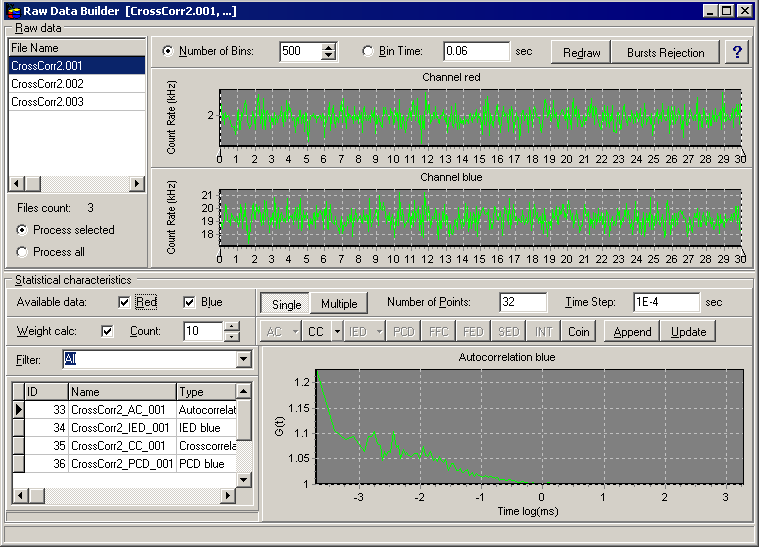 Bursts Counting window is designed to perform coincidence bursts analysis. - Calculating of percentage of coincidence bursts from a number of bursts in selected channel. 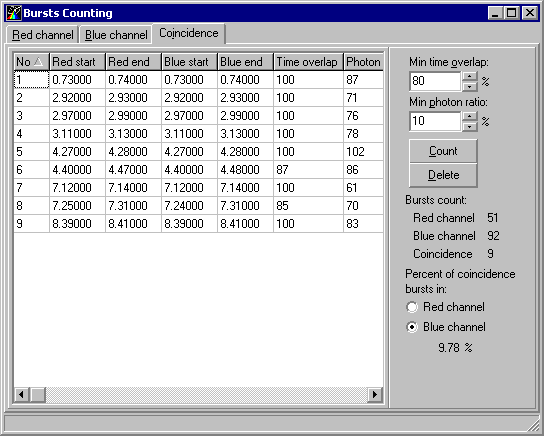 The Coincidence page allows selection and counting of coincidence bursts by analyzing of start/end positions of each burst in both channels and calculating of percentage of coincidence bursts from a number of bursts in a selected channel. Only bursts with given time overlap and photon counts ratio (in percent, implemented for the accounting the leaking of the fluorescence from blue to red channel) are counted. Status bar, which is a horizontal area in Bursts Counting window below the all panels, provides information about the current state of application and any other contextual information. Displays coincidence bursts. It display start/end positions of the burst in both channels, time overlap and min photon ratio (implemented for the accounting the leaking the fluorescence from blue to red channel). Use local menu for exporting start/end positions and number of photons in CSV file and highlighting the leaked bursts in the red channel by blue color (redraw red channel chart for removing such highlighting). Starts the selection and counting of coincidence bursts at given time overlap and min photon ratio. Is used to select the channel for calculation of percentage of coincidence bursts in it. Use this edit to set min time overlap (in percent) between bursts in both channels. The burst is marked as coincidence burst if time overlap between correspondent bursts in both channels is more or equal then given one. Use this edit to set min photon ratio (in percent) for the accounting the leaking of the fluorescence from blue to red channel. - Export of start/end positions and number of photons in CSV file. This Bursts Chart displays intensities in a channels. One can select necessary time range of raw data for bursts selection by means of data markers. This button starts the bursts selection and counting procedure. Is used for manual selection of bursts. Adds the selected by means of yellow data markers burst to the grid. Is used for manual selection of bursts. Deletes the bursts selected in the grid. Is used for manual selection of bursts. Updates the selected burst with a new selection. Is used for manual selection of bursts. Clears the list of bursts. Calculates raw data intensity and redraws the chart. Sets logarithmic scale of Y axis and redraws the chart. Performs the Lee filtration of intensity and redraws the chart. Use this edit to set the minimal count of photons in a burst. The only bursts with number of photons more or equal to given value are selected. This limit does not work while manual selection of bursts. Use this edit to set the half width of Lee filter. Bursts chart is a standard 2D Chart with embedded vertical and horizontal markers. It displays intensities in red or blue channels. One can select necessary time range of raw data by means data markers. 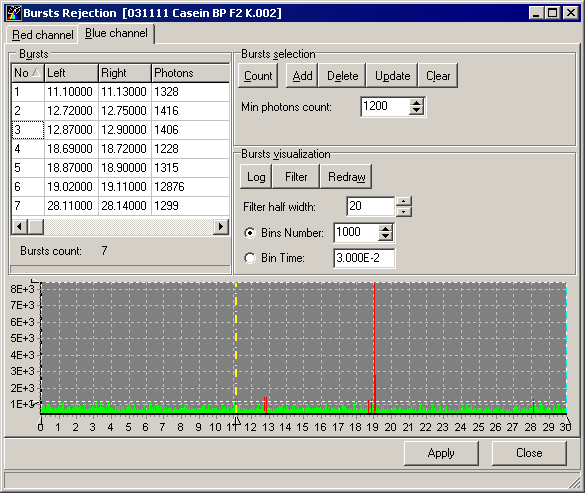 Calculate Photon Counts: Opens Photon Counts Calculator dialog box to calculate number of photons in a time range of raw data defined by data markers. Bursts Rejection window is designed to reject unwanted bursts of intensity while calculation of any characteristic. It allows automatic selection of bursts in both channels separately by setting min and max threshold. Status bar, which is a horizontal area in Bursts Rejection window below the all panels, provides information about the current state of application and any other contextual information. This button applies rejections to the raw data. This button closes the Bursts Rejection window. Use Calculation options dialog for setting a number of calculated characteristics and range of bin times. The following time scales are supported: linear, quasilogarithmic and logarithmic with base 2. This button opens the help window that describes how to work with Calculation options dialog. Specify time scale of bin times. They can be either linear or quasilogarithmic or logarithmic with base 2. 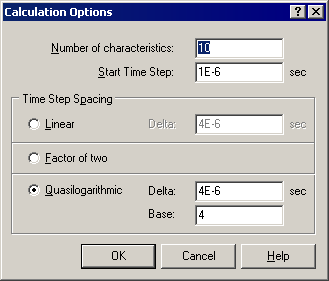 Specify initial time step of quasilogarithmic scale. Specify time step of the linear time scale. Specify base of quasilogarithmic scale. where r0 is a constant characterizing the filter. It is calculated by Eq. ** from background photons, i.e. from a region on a raw data trace where almost pure background is present. Quick Search Displays a search box for the corresponding field. If you want to find quickly the necessary record you should type the first few characters and press Enter. In this case the application will automatically select the first record that contains at the beginning the characters, which matched the typed ones. For the Numeric, Logical and Data/Time fields you should type the whole value for the correspondent field. To close the search box, press Esc. Filter Opens Filter dialog box that allows to create the filter that can be applied to the selected table. If this filter is applied, the only table records that correspond to the filter criteria will be displayed. Remove Filter Removes the filter from the table. FRD (Flow Raw Data) is a set of simple dataformats like one column list of doubles representing photon arrival times. Users can save your own raw data (f.e. simulated) in FRD dataformat in order to use them in the FFS Data Processor. Raw data that can be processed by Raw Data Builder is a list of time events but not counts per bin, i.e. binned intensity is not the raw data, it is its characteristic. char IDBeg; // = "ID:"
char IDInfo; // = "FLOWDATABE"
char IDEnd; // = "\r\n"
char VerBeg; // = "V :"
major = T, minor = 2 - text file containing two column list: double value that represents photon arrival time in the first column and router information in the second (time and router are separated by tabulation, one photon info per line, lines are separated by "\r\n"). Such file can be easily created by any datasheet processor like Excel (Note: Be careful with header. Remove unnecessary tabulation at the end of each line).